With Steve Nikorak embarking on his professional career with the Chicago White Sox, the Temple Owls open the new campaign with the serious challenge of finding leadership and production. The Owls’ ability to fill this void might depend on the bat and glove of sophomore shortstop Nick Lustrino. A native of Spring Lake, N.J., Lustrino pieced together a solid freshman year, hitting .291 over 49 games while recording the most hits in a Temple rookie season since all-time hits leader Byron McKoy. "You don’t expect a freshman to handle the number of different roles we asked him to play, and he did it tremendously," said Owls' head coach Ryan Wheeler. Last season was Wheeler's first at the helm and the Owls finished 19-34. He expects an improvement this season. Unfortunately, Wheeler's expectations were tempered a bit on Friday as the Owls dropped both sides of a doubleheader in Cary, N.C. - first falling to Wright State and later to Delaware. Lustrino was the Owls' lone highlight, collecting a combined three hits including a double and a home run. With time, Wheeler believes Lustrino can grow into a leader and one of the better players in the region. "Knowing that we're going to be playing him at shortstop, I just see more confidence in him," Wheeler said. "He makes all of the routine plays and has improved his lateral range. I see him emerging and being more of a leader on the club." The Owls face Monmouth on Saturday at 3 p.m. before finishing the weekend Sunday with a contest against Toledo at 10 a.m.
- Contact Samuel Botwinick at sbotwinick@philadelphiabaseballreview.com. 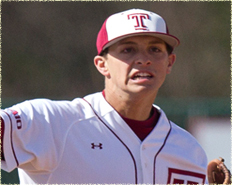 Lustrino was not the lone highlight for Temple on Friday. Three home runs in the final two innings (one of which was Lustrino's) and pitchers Zach White and Steve Visnic coming in and shutting down Wright State late was key. Connor Reilly collected three hits as well, one of which was a home run. Too much to say Lustrino was their lone highlight. John, it was a tough day all around. It was good to see White and Visnic back on the mound, though. Weather sure impacted what otherwise would have been an action-packed Saturday and Sunday for the area teams.